I've been reading The Mortal Instruments. And while I find the writing to be not so great, (Basically on par with Stephenie Meyer's Twilight series) I still like the whole world in which Clary Fray lives in. It's basically all supernatural. And I'm hoping that the movie which is coming out in August this year, will be better than Clare's writing. Because the one thing I hate more than bad writing is bad movies. The one thing that irks me is Clary's way of getting involved in everyone's business, and always running headfirst into situations without analyzing the details first. I mean I understand she's a teenager, who probably has raging hormones, but even when I was a teen, I wasn't running into unknown situations and getting in trouble. If you don't already know, I have a love for zombie related books. So when I read the cover for Ashes, I knew I had to read it. And then earlier this year I decided to pick up Shadows, which is the 2nd book in the 3 book series. While I really wanted to finish Shadows, I couldn't because I was freaked out that Alex the main character would die. But you will have to read the book to find out what happens to her. No spoilers on here! I love love LOVE Gabrielle Zevin's writing. I seriously think that All These things I've done should become a movie. And I thought why not read one of her other books? So I picked up elsewhere, and when I got to the end I was crying. It's such a moving story about a 15 year old girl who dies, and goes to elsewhere. You have to read this book! Does anyone have any good one book no series to suggest? I'm not loving the fact that every time I read a book I have to wait a year for the continuing book to be released. I want to read the Grace Coddington book I have a B&N gift card I need to use! I do not read to many of these types of series but I did read The Hunger Games trilogy but I am sure you already read those! I really like the Mortal Instruments. Of course, I was only interested enough to read one of the books but it was engaging. Not great in the whole scheme of things, but a fun read for the time being. I'm checking out some of your other recs! 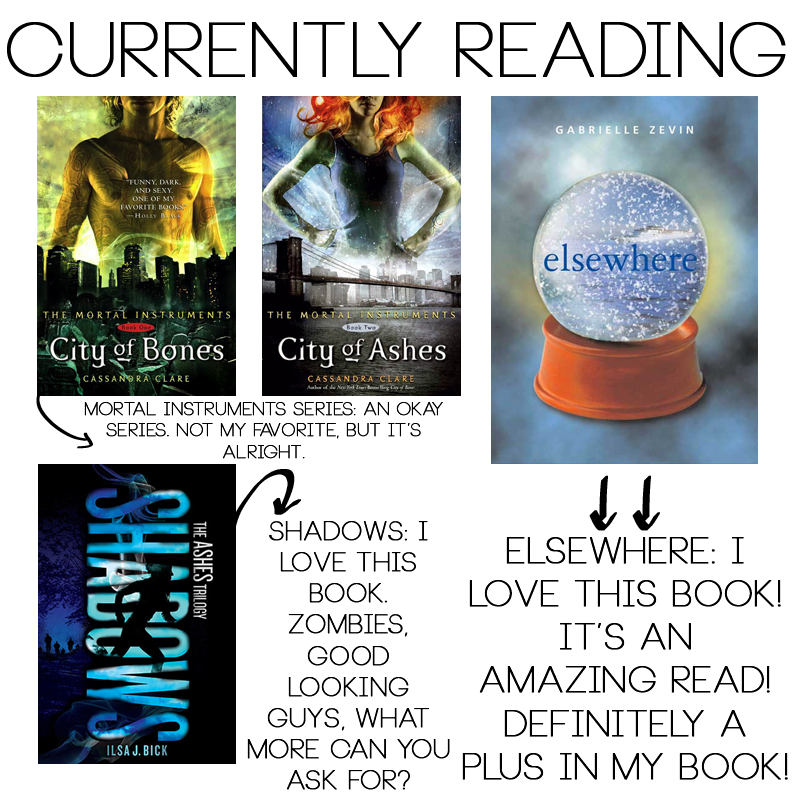 Totally agree with you on the Mortal Instruments series. I love the world that the author created, but the characters were so emo and moody that I would get really irritated with them. Still, I read every book just for the sake of completion! I am adding Elsewhere to my Goodreads list now!